This homify tour will explore the twist and turns of this unique horseshoe magnet house, both inside and out! 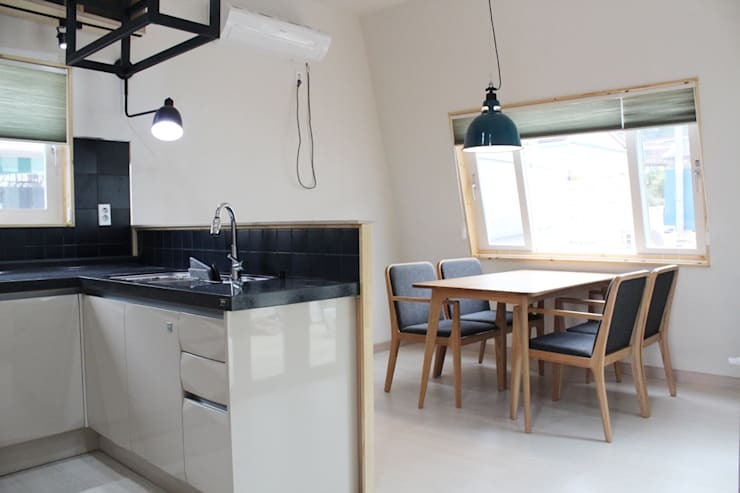 The architects from Dreaming Carpenter conceived this uniquely shaped structure in a mid-sized city in Korea, creating a family home that abounds with contemporary design and an air of simplicity that borders on minimalism. With a unique exterior structure that's cause for the apt nickname of the Horseshoe Magnet House , the home's floor plan includes two levels and an attic, all constructed with a lightweight wooden frame. 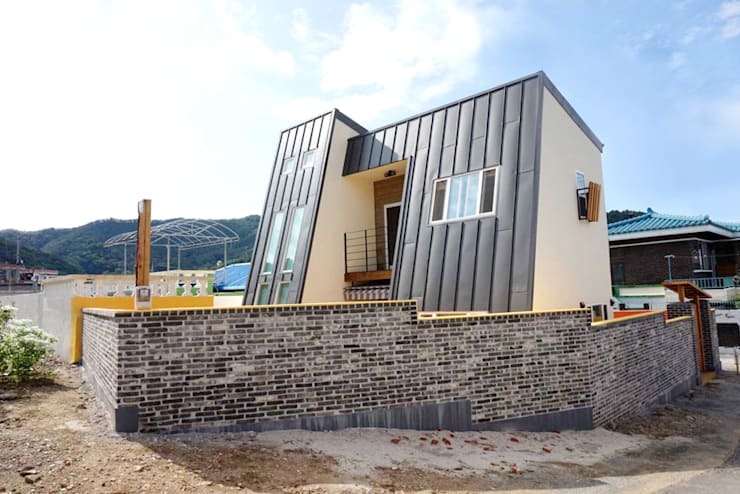 The architects have designed the home to enjoy a base that's sheltered from nearby noise coming from street traffic, giving this open-faced facade a bit of closure with a high brick wall. From here, you can observe the way that this home appears to jet out from the ground in an open, relaxed lean, creating a look that conveys a feeling of openness and relaxation in the structure itself. Here's the reason why the home has been nicknamed Horseshoe Magnet House ! The steely grey of the zinc roof covers both sides of this U-shaped structure, forming dark grey buttresses that take on a horseshoe appearance. 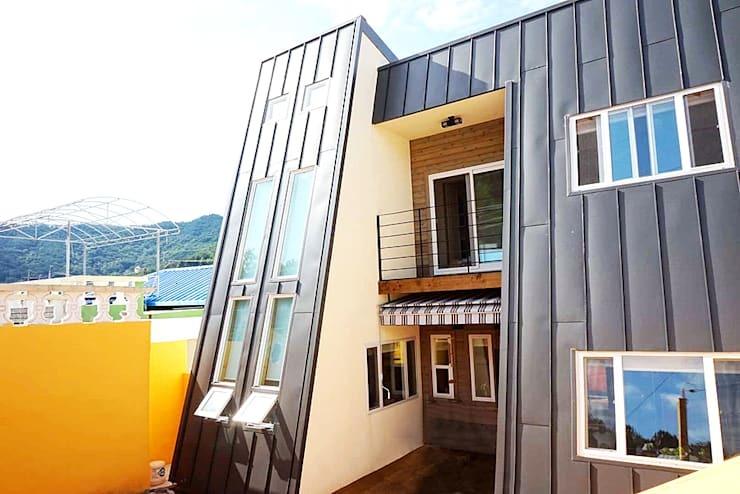 The addition of long, vertically-oriented windows only serves to magnify the strong vertical lines of the home's slanting facade, creating strong vertical movement in the exterior's design (not to mention, allowing plenty of sunlight to reach the interior area of the home). The way the upper floor's balcony has been attached in the center of this sheltered horseshoe area makes for a secret deck to enjoy outside views without being viewed by the neighbors – a clever design that takes advantage of the home's unique shape. On the ground level, the enclosed space has been used to create an intimate and sheltered patio that's useful in all seasons, sheltered from wind and rain. Like the way this facade commands attention? Have a look at these 5 facades that underwent some serious makeovers to become welcoming and attention-grabbing features of the home. Inside, simple lines and square geometries characterize this minimalist space. Light tones in the smooth floor serve to reflect light onto the lightly hued walls and furniture present in the room, making for a living space that's simple, airy, and light. One notable feature in this room is the way that the stairs have been designed with two phases that appear to separate the ascent into bottom half (black) and top half (white), the bottom section of the stairs being hollowed out as to appear as unobtrusive as possible as it extends into the room. 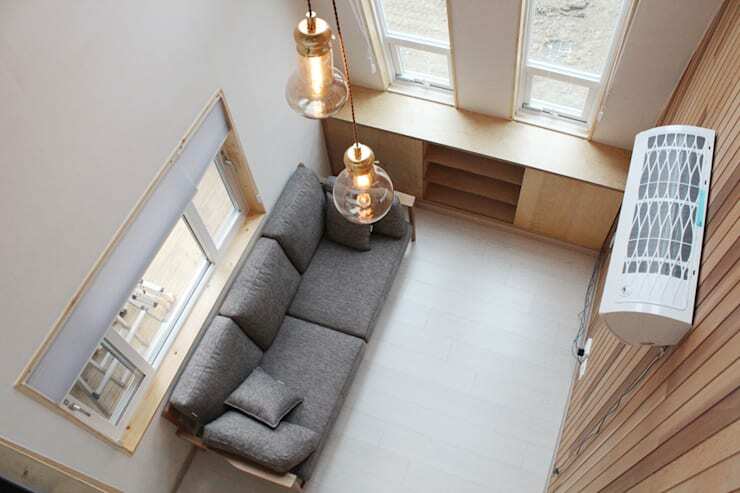 This living room doesn't enjoy a very large floor plan, but it certainly benefits from a lofty sense of height! Here, two simple bulbs dangle from a ceiling far above the living room floor, in a space that leaves plenty of headspace for quiet thought. Behind the couch, you can see how the living room's vertical tunnel of space has been opened to the other areas of the home via the inclusion of a window that creates a more friendly link between the two areas of the home. 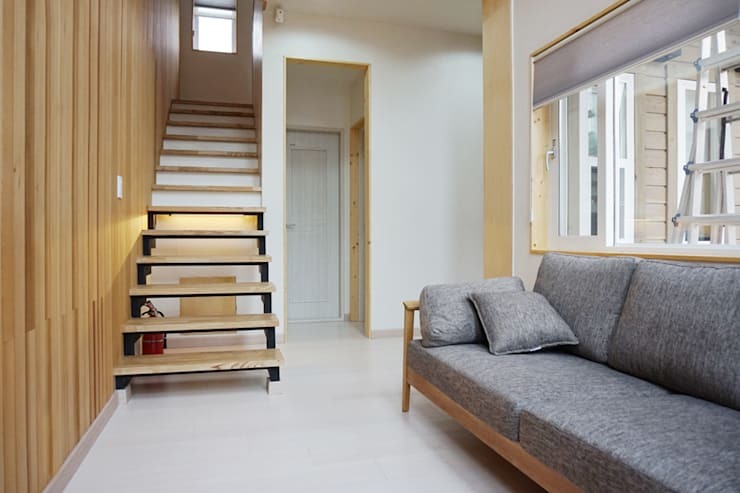 The result is a quiet and secluded living room that, while separate from other living areas, retains just enough openness to be sociable and accessible. As if the home weren't already serene enough, opposite the living room area you'll find a workspace which, although quiet, offers a colorful and energetic environment. 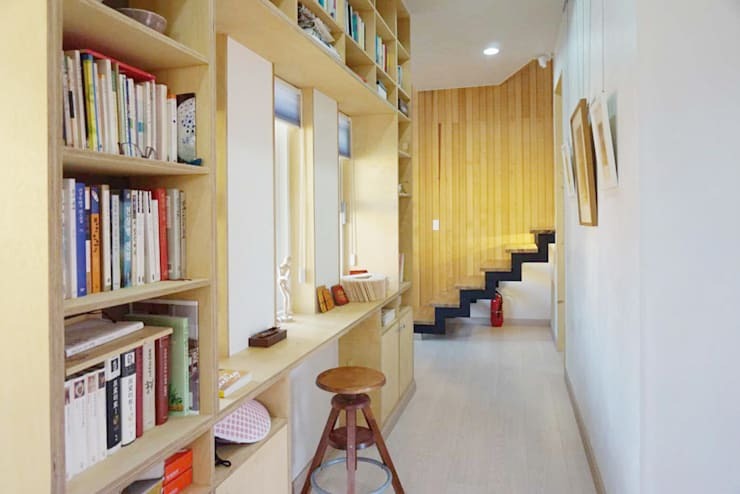 The architects achieved this sense of energy through the use of a warm, yellow wood that serves as a cheerful background for plenty of colourful books and study materials. Not only does the living room enjoy a quiet spot all its own, this study, located in the opposite leg of the horseshoe, finds peace and quiet in its own little niche as well. It's hard to believe that this space is a kitchen – with surfaces so sleek, corners so crisp, and surfaces so abruptly square, this kitchen gets a highly streamlined and modern look. 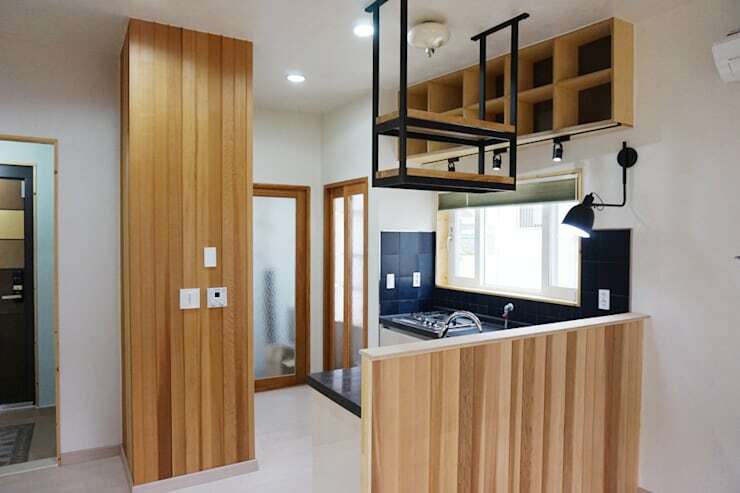 While it's a conservative floorplan for a family kitchen, the designers have added storage in the suspended ceiling rack and cubby shelves that line the ceiling, allowing the kitchen counter to enjoy friendly open access to the dining room beyond (shown below). Searching for more unique kitchen inspiration? This ideabook features 16 kitchens to whet your appetite! Once again, this home's furnishings make a statement of just enough : a single industrial lamps dangles from a lofty ceiling over a simple window side dining room table. The grey-blue chairs and turquoise metal of the lamp pick up the blue theme from the kitchen, linking the two spaces together as one. It's hard to imagine a dreary morning with a sunny table like this one – the placement of this dining room table right under the slanted window sheds the maximum amount of light onto the polished surface of the wooden table, making for a cheerful and upbeat dining area. 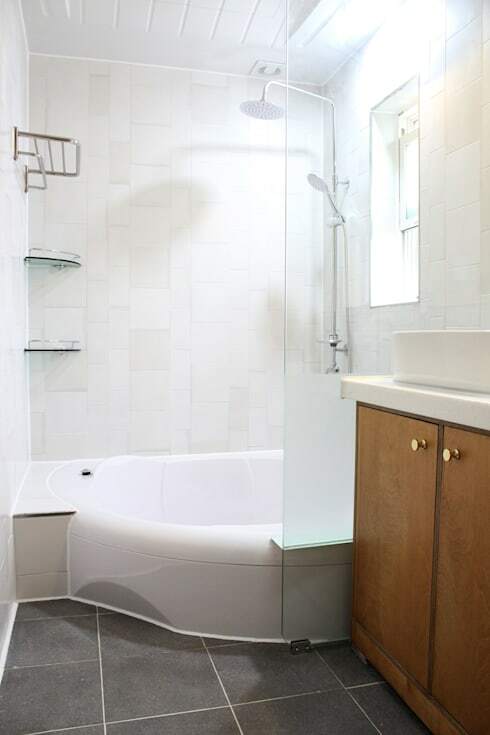 This bathroom has been designed to fit snugly into the tiniest of spaces; however, despite its small size, this bathroom still has all the features to make it airy, appealing, and convenient. Note the shelves that have been installed in the corner, resting beside a towel rack that hangs conveniently close to the standing shower. A glass panel separates the shower from the sink in an unobtrusive way, allowing the shower stall to sneak quietly into the very farthest corner of the bathroom. Once again, the design of this interior says I have everything I need . 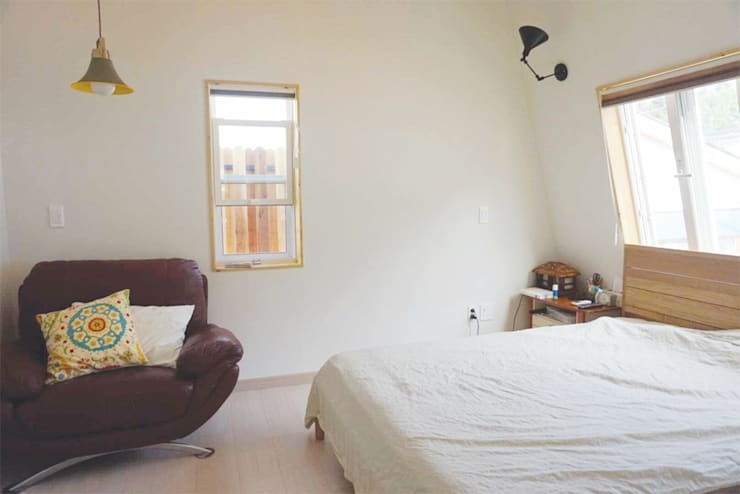 Somewhere between simple and sparse, this bedroom features a single chair, low-lying bed frame, and tiny table tucked away in the corner. It's a great design for anyone who enjoys having some blank space that's distraction-free before nodding off to sleep at night! What do you think of this stylish family home? Share your thoughts below!